Philippines’ No. 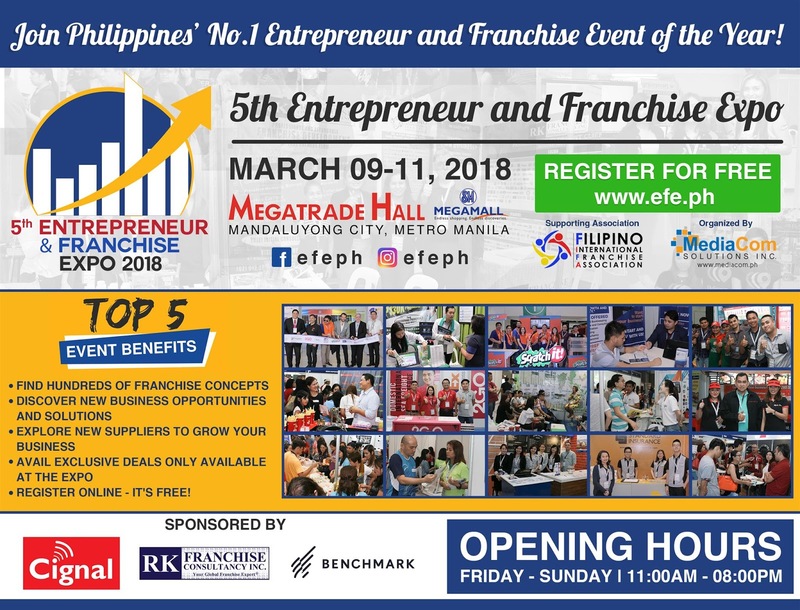 1 Entrepreneur and Franchise event, the Entrepreneur and Franchise Expo [EFE], is set to launch on March 9, 2018, at Megatrade Hall, SM Megamall, Mandaluyong City. Now on its 5th year, EFE is a trade exhibition and networking event dedicated to showcasing multiple franchise concepts, from food and drinks to health, fashion, grooming, salons, cleaning, automobile, transportation, storage and much more. This 3- day event will also feature multiple business suppliers dedicated to empower small and medium-sized business owners. With its tagline “Your Step to Success”, EFE is organized by Mediacom Solutions Inc., a leading trade show and conference organizer from the Philippines. The show expects 100 Franchise Businesses and SME Business Suppliers to participate with over 10,000 Visitors. This tradeshow brings together thousands of aspiring entrepreneurs and business owners from multiple industries. “Franchising remains one of the most popular ways for Filipinos to start a business. It is expected that the franchise industry in the Philippines will grow by 20% by the end of 2018. 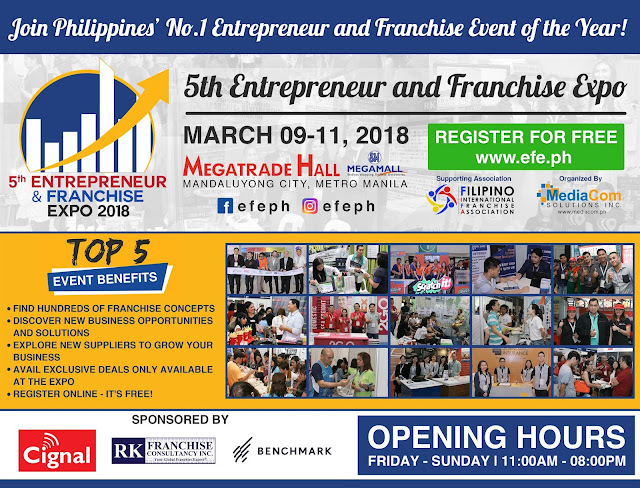 The goal of the Entrepreneur and Franchise Expo is to give aspiring entrepreneurs an overview of the franchise industry in the Philippines and to connect franchisors with interested franchisees. At the same time the expo will also showcase various business suppliers catering to small and medium-sized businesses that can help them to grow their business.” says EFE organizer and Mediacom Solutions Inc. CEO, David Abrenilla. EFE is sponsored by CignalTV, RK Franchise Consultancy and Benchmark. Don’t miss this great opportunity and register online to attend the expo for free at www.efe.ph. For exhibition and sponsorship inquiries contact Elvis Elorde at +6325094792, or +639273951575, or send an email to elvis@efe.ph.